Although Splintered released countless singles on both sides of the pond including labels such as Noiseville and Drunken Fish in the USA and Shock Records and Dying Earth in the UK that characterised them as a noise rock band, the sound on their albums was much broader sweeping up other instrumentation and styles. Moraine which was originally released by the German labels Suggestion Record and No Risk No Fun allowed them to really stretch out their wayward vision. Issued on vinyl with each track given a side apiece it gave the group ample space to extend their experimental and improvisational tendencies. You can hear it in the extended intros and outros of the two tracks that originally comprised Moraine, and on the varied instrumentation ranging from theremin, piano, keyboards to accompany their rock dynamics. And that's without even mentioning the radios, telephones and metal rods plundered for effects. Moraine is a fine example of noise rock pushing the boundaries. 'Moraine (One): Flagellum Dei' opens to several minutes of soft piano keys, theremin wails and something of a typewriter processing type sound. Alright there's at least seven minutes of experimentation and radio interference before low distorted bass tones and 'rock' drums kick in and this lurches forward. Amidst distant chanted vocals and keyboards that whoop and dive 'Moraine (One): Flagellum Dei' marked a big step forward for their noise rock sound based. For whatever reasons Splintered remained resolutely underground and never received the acclaim their peers garnered, even though the group recorded two sessions for John Peel. It's a pity as their sound elicits comparisons with some renowned names. Splintered were more noise informed than Loop, less drug based than the garage psych of Spacemen 3 and less extreme than Skullflower or Ramleh who had just picked up their guitars. 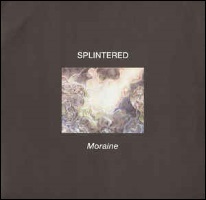 We recently reviewed the Splintered retrospective CD Turned Inside Out featuring compilation cuts, demos, alternate versions and many of the singles but with its sheets of guitar squall enveloped in synth abuse and theremin wails ebbing out on a lengthy outro of guitar vapour trails, piano tinkering and theremin oscillations the extended duration of 'Moraine (One): Flagellum Dei' catches Splintered in full flight highlighting a different aspect of the group when given space to flesh out their psych noise with untold experimentation. With bass tones, radio samples and frequencies and the smash of glass, 'Moraine (Two): Humayun (redux 2017)' lunges into soaring abrasive guitar, mixing distortion with layers of electronic frequencies. While the drums pack a punch the guitars just lack a clarity and forcefulness that it requires to really pile on the damage. Still they lock into an atonal groove for several minutes, emitting feedback and distortion in equal measure. It changes dynamics throwing in sax blurts and propelled by powerful rock drumming it ups the intensity levels to the point it sounds like it will collapse in on itself. That sax might have its roots in free jazz but here confined within the realm of Splintered's guitar noise those frenetic sax parps seems more informed by something like the jazz-noise of Painkiller or - and I'm sure I won't be thanked for this - Kevin Martin's God. That said neither of those outfits had the whirr of electronic skree lurking underneath it all. It all kicks off again around the midway point with hollered vocals jostling with the soaring waves of guitar squall, sax and noise modulations dissolving into a shimmer of tones, thuds and shudders, newly supplied by Stuart Carter and Sion Orgon. Moraine is rounded of with 'Moraine Chase (Receding Cap Mix)', an additional mix from Band of Pain aka Steve Pittis who himself is a former member of Splintered and featured on the original Moraine release. Honing in on the individual sound components his sound processing splices, chops up, elongates and generally fucks around with the source material to give it an abstract rendering a la Nurse With Wound.